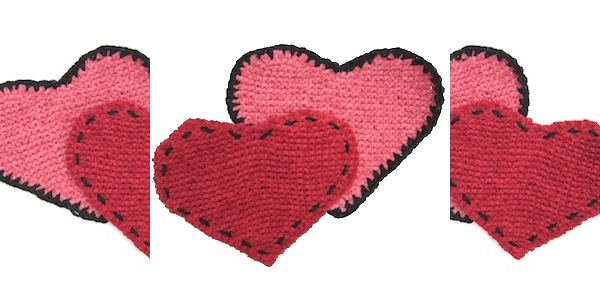 Years ago I made these pretty, little cotton chenille washcloths for all my girlfriends for Valentine’s Day. One of my friends told me they were the best facecloths she had ever used, super soft and they laundered beautifully. Last year, Susi sent me a huge package of cotton chenille and I thought I would share this simple pattern with all of you. I used Crystal Palace cotton chenille, because I love the muted colors which I think make these look a little like old fashioned valentines. You can keep them very simple or add some crochet or embroidery trim to dress them up a bit. A note on cotton chenille: it is a little tricky to work with as it doesn’t slide easily on itself which can make getting really even stitches a hard. Don’t worry the fuzziness of the yarn hides a little variation. Also make sure not to tug the yarn too tightly, it will break much easier than other yarns. Put the stitches on the stitch holder back on the needles. 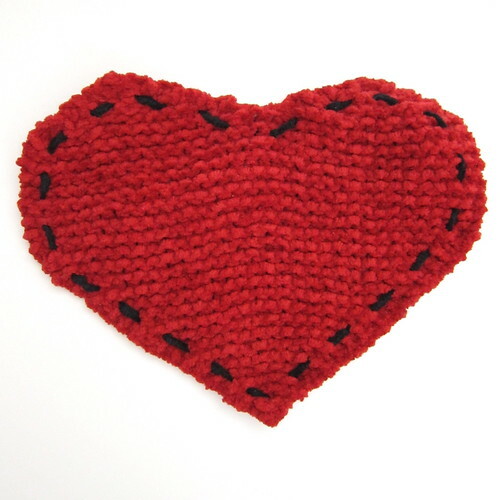 Join the yarn in the middle of the heart and knit 1 row. Then follow directions for rows 50 – 56. Use the tapestry needle to weave in the ends. 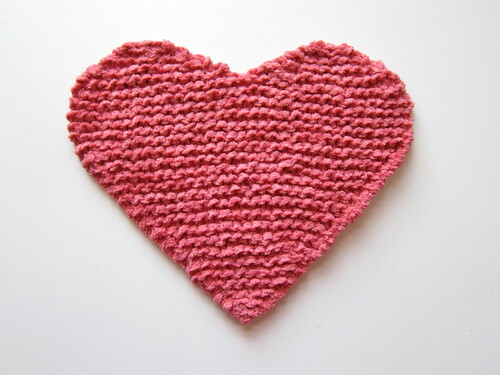 At this point you will have a plain heart washcloth. You can dress them up a little more with some basic crochet or embroidery and contrasting chenille. 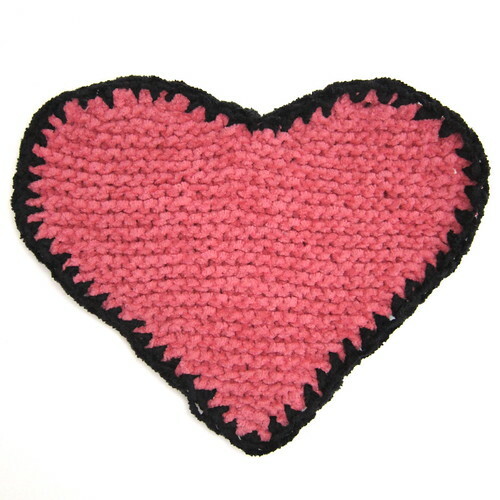 This heart is edged in crab stitch (single crochet going left to right). A blanket stitch would work as a pretty edging too. Even simpler is a simple straight stitch. If you find any mistakes in this pattern please let me know, so I can fix them. Do no sell or duplicate this pattern. Do not sell items made with this pattern. Do not teach this pattern without my permission. Thank you. 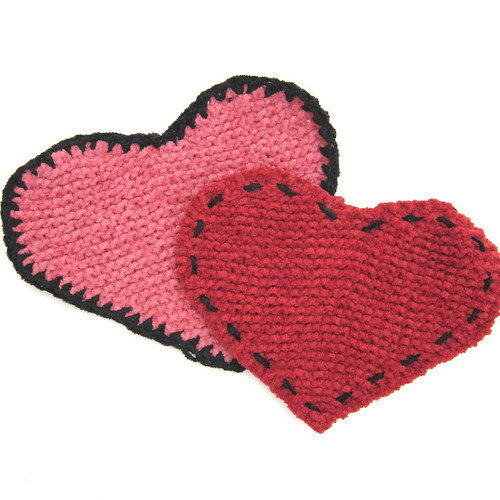 7 years ago by Kat in Holiday , Knitting , Knitting Projects , Needlecraft , Projects , Valentine's Day | You can follow any responses to this entry through the RSS feed. You can leave a response, or trackback from your own site. Cute. Just a note, there are a couple of places you refer to a stitch marker, but I’m pretty sure you meant a stitch holder. Happy crafting! Oh my gosh, how embarrassing! Ok, fixed. I am off to try mine. A good project for a dreary winter day. Thanks for the pattern. 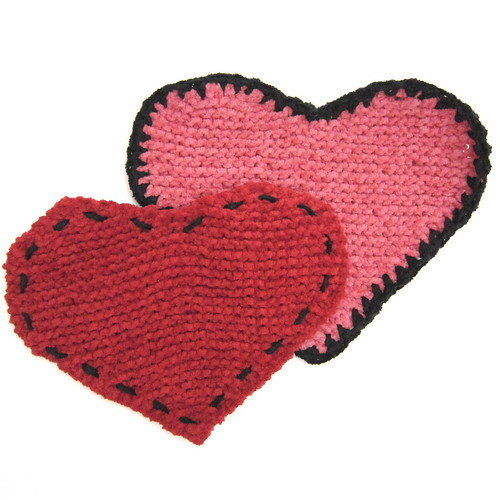 Thank you,,,I love the look of them but I can’t read patterns,,but I am going to try..I do knit dishcloths. Where I have a time with is increasing and decreasing. Karen, if you practice each stitch listed in Abbreviations, you’ll do just fine. YouTube is a great source of information to WATCH. YouTube is a great source of learning by watching. If one teacher doesn’t work for me, try another. I really like these washcloths. Will do a few for next year! Hi! Can you tell me about how big the finished cloths are? Thanks! The gauge I used was 5 stitches per inch and the longest row is 33 stitches, so about 6.5 inches wide. If you knit them at a different gauge they will be a different size. I made a bunch of these for my friends and they said they washed up beautifully in the washing machine, coming out very soft, but I will say these were also friends in the UK & I think they may have line dried them. It was quite a few years ago, so that is to the best of my memory. They may shrink a bit in a dryer since they are cotton.